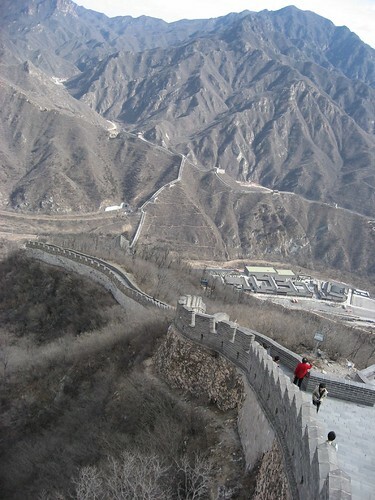 This was my second trip to Great Wall, but the first with a camera. 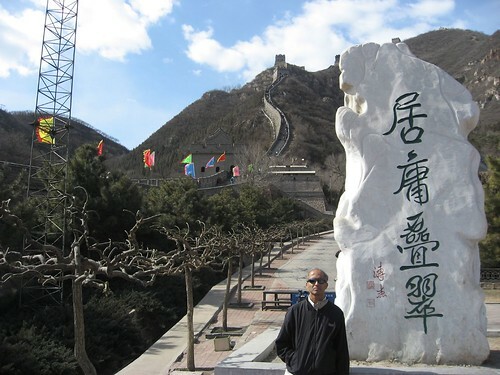 On both occasions, I visited Great Wall during winter, which kind of restricted my movement, but nevertheless, I enjoyed this trip than the earlier one.. partly because I had company and partly because we walked a lot.. compensating for my lack of 'runs'. 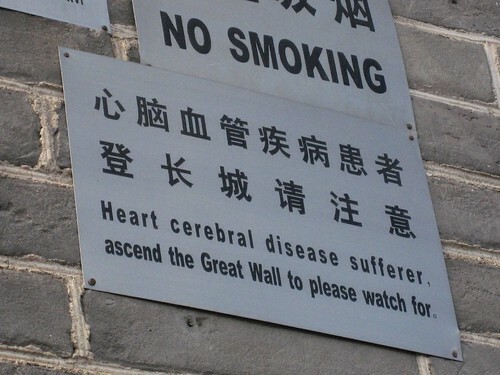 I am not sure which portion of Great Wall I went this time.. but it is not the same as the previous one.. Our guide did tell us the name.. but not able to recollect now. This place is about an hour drive my Beijing 3rd ring road. 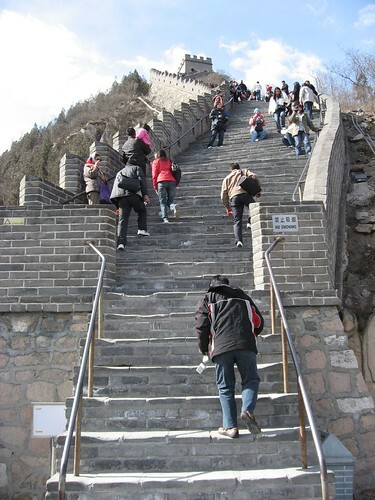 We started relatively early to beat the traffic and the crowd at Great Wall. Like any other big city, Beijing is famous for its traffic snarls and pollution.. In fact, that is a big concern for the Olympic organizers. 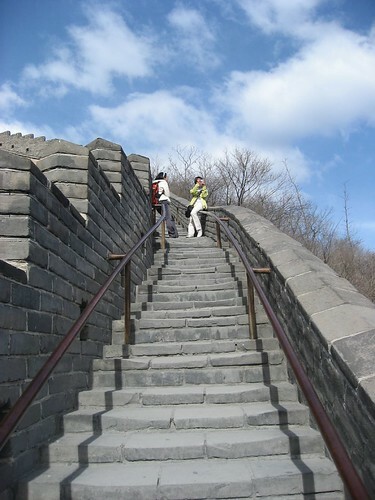 Great Wall has many sections and the one we climbed was rather steep and had lot of steps. My colleague counted over 1700 steps which took us over an hour to climb with frequent stops in between. 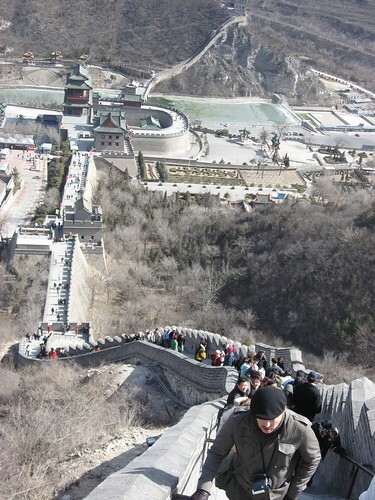 It started getting crowded by the time we started descending from the wall. I met folks from Texas, Virginia and many other states US. I even met a small crowd from Bangalore on assignment in Beijing. Lock to be wedded for life.. Saw a long chain across a section of the wall with hundreds of locks tied together in pairs.. with a red ribbon. 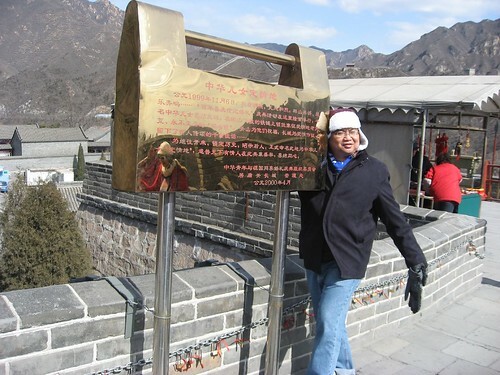 Our guide explained that husband and wife come to Great Wall and put these locks up and tie them together with a red ribbon so that they be 'wedded' for life. The section of the wall we climbed had 6 pit stops (rest areas) like this one. Once used as watch towers, these are now used to sell souvenirs. Thanks to technology, neat looking certificates with your photos are available for a stiff price. For us, we decided to make do with just these pictures. 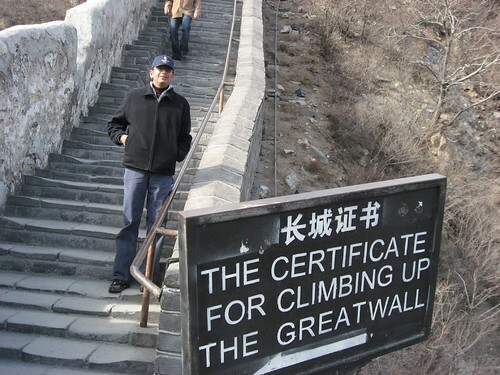 Climb at your own risk.. In all, the trip was a memorable one. 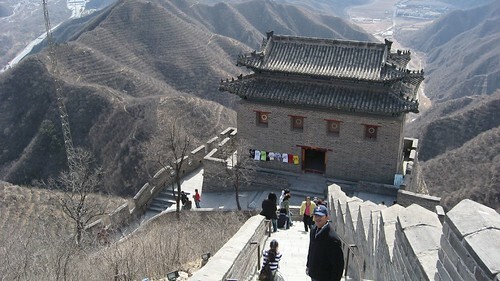 It took us little over 4 hours to visit Great Wall and come back to the city. 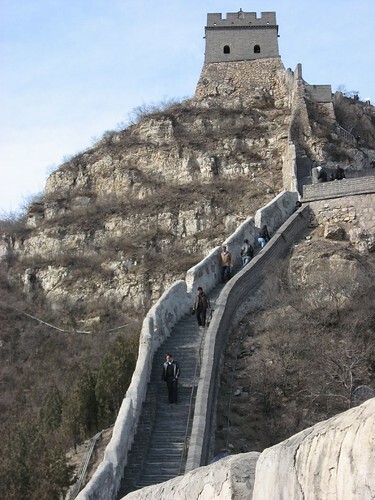 This monumental edifice must have taken tremendous resources and energy to build and is no doubt impressive. But what is not clear is did these walls serve its purpose? I don't think so.. but mankind has not learnt its lesson from it as we continued to build more walls even in the twenty first century.. be it in Indian subcontinent or Middle East or North America or Nicosia or Korean peninsula, mankind is simply building more and more walls to keep his own kind at bay..